Facebook can be so much fun. And so broadening: You get to “meet” all kinds of people who are involved in all kinds of businesses, hobbies, and activities. Because of my own interest in crafting with tea — tea-dyed textiles and tea-bead jewelry via CrafTea Designs — I’m always delighted to find fellow tea lovers and crafters whose products feature genuine tea. 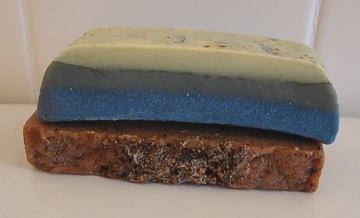 Ocean Surf and Chocolate Masala Chai soaps. One such person is Kim Williamon, proprietor of The Gilded Lily Soaps & Scents, who handcrafts luscious soaps that incorporate tea in their chemistry and their design. I recently had the opportunity to ask Kim a few questions about her business, her craft, and her teas. I’m very lucky to have my 92-years young grandmother still with me today. She was a big part of my life growing up. Raised on a large sugar cane farm in South Georgia with her mother and grandmother, she learned to make soap at an early age, along with many other farm crafts. I had the great pleasure of watching her make soap in my youth, and my love for the craft grew. When did you start adding tea to your soaps? 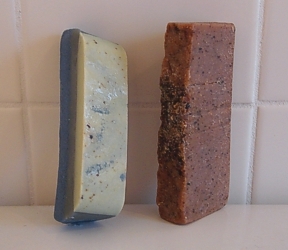 I started adding teas and tisanes to my soaps in the early 1990s, inspired by my husband: He has very dry, sensitive skin, and is prone to seasonal breakouts. After many trips to our family doctor for creams and shots, which provided no help, I began to research the health benefits of tea and herbs. What are some of the benefits of adding tea to soap? Do you make any products other than soap? Do they also incorporate tea? Currently I’m working on liquid soap and body “butter” formulated with tea. These will be added in time for the summer season. The soaps are beautiful (be sure to visit their Pinterest page) and smell even better! What kinds of teas do you use in your products? I use only organically-grown whole-leaf loose-leaf teas: whites, greens, oolongs, and blacks. For soaping I grind the dry leaves myself; I’m not a fan of teabags or pre-packaged teas. How do you decide which teas to use for specific soaps? I choose teas for their particular benefits to a skin type: dry, oily, sensitive, etc. And I also create seasonal and holiday soaps with the scents I add. How can customers find and buy your products? At the moment I’m still working on a website and hope to have it up and running soon. Meanwhile, anyone interested in beautiful soaps made with tea can find The Gilded Lily: Soaps & Scents on Facebook; if you “Like” us and add us to your newsfeed you’ll be notified of new products and when our website goes online. Send me a Direct Message (DM) to order. For product photos and pricing, visit our Pinterest page. What are your favourite teas to drink? In my cup I like oolongs (Formosa Spring Dragon, Ti Guan Yin, and Se Chung), Japan green teas (Gyokuro kenjyo, Ho-ji Chi Kamakura, and Gen-mai Cha), and white teas (Moonlight and Yin Zhen Bai Hao Downy White). As I do with Taiwan oolongs, I used a small two-cup pot for this Taiwan black tea. There once was a time when black tea came from India, green tea came from China or Japan, and oolong tea came from Taiwan. It was very simple. But then the different regions — terroirs — began to experiment with processing different types of teas. The first time I sampled green, oolong, and white teas from Darjeeling it was a revelation … who knew that at the source for arguably the best black tea on Earth they were busy processing their teas other ways besides fully fermented/oxidized? Well, they were, and it was a great success. So great a success that other growing regions in India, as well as in neighbouring Nepal, followed suit. Now “alternative process” teas from these regions are readily available. More recently, the source for arguably the best oolongs on Earth — Taiwan — began processing black teas. And the results are amazing. I rarely say “always” when it comes to tea, but every Taiwan black tea I’ve sampled has been ethereal, elegant, exquisite … always. Case in point: This Yuchi Wild Mountain Black Tea. While everyone knows about Camellia sinensis’ wild Indian cousin Assamicus, and many of us were aware of wild tea plants — actually trees — growing in China, I just recently learned about Shancha, the wild tea plant of Taiwan. Processed as a black tea, the Yuchi is nutty. Flowery. Smooth. A very easy drinker. The subtle qualities of the leaf will appeal to sophisticated palates, and it’s also a light and lovely cup by which to introduce a newbie to high-quality teas. The dry leaf is quite large and dark, and I obtained the best results in a small two-cup teapot using water brought to a boil and then cooled down to oolong (“fish eyes”) temperature, then steeped for no more than four minutes. A truly delightful black tea from Taiwan. Don’t leave home without your tea! If you travel much — whether it’s a weekend getaway or a lengthier trip — you know how difficult it can be in some places to get a good cup of tea. It’s when you’re visiting those kinds of places that a tea travel kit can be a life saver. 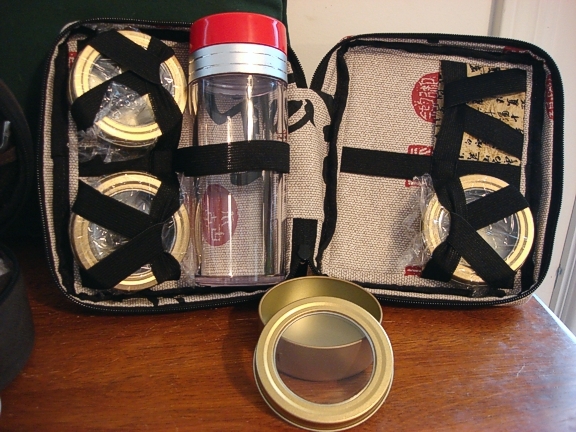 For many years I rigged up my own tea travel kit; maybe you do the same. A well-stocked kit comprises tea, something to steep it in, a cup to drink it from, and any other accessories you include in your own personal tea ritual (strainer, filter bags, sweetener …), and of course some kind of bag or box to carry it in. Then I discovered that there are much more elegant ways to go about it. My compact Taiwan-made tea travel kit. Some years ago I purchased a small tea travel kit made in Taiwan from a vendor who is no longer selling them, sorry to say. 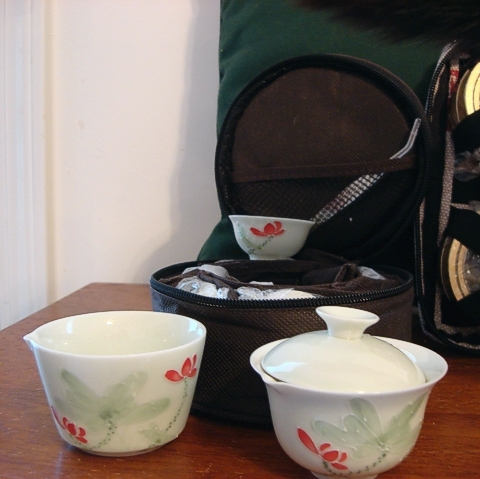 The kit comprises a gaiwan, a water/fairness pitcher, several tiny cups, and a tweezers, all packed into a well-padded round bag. Generally I pack an ounce or two of tea in a small plastic bag that tucks nicely into the gaiwan. I’ve used it several times, mostly when I’ve stayed at a hotel whose idea of tea is a basketful of assorted teabags, and mostly herbals at that. The nice thing about this travel kit is that it’s very compact and can tuck into a large purse or a small carry-on type of suitcase. That same compactness also limits the amount of tea I can steep up, and sip, at any one time. It’s not a major limitation for tea varieties that lend themselves to multiple steepings, but it is a bit of a nuisance when I want a big cup of hearty black tea. A few weeks ago I received a somewhat different type of tea travel kit. This one, from Thistledown Cozies, is dubbed The Brick for its, well, brick-like shape. Like all Thistledown products, this kit is made in the USA and is exceptionally well-made: not a stitch out of place, no loose threads, and will no doubt last for many years. The fabric is exceptional too: mine is in pretty pattern #11 (scroll down on their page to see fabric selections). The Brick tea travel kit. The portable tea steeping cup is not included, but the tea tins are. You can also see the elastic straps and the pocket under one of the tea tins. The kit is rather larger than my Taiwan-made kit, tho’ easier to transport on its own thanks to a built-in handle. Thistledown’s take on the necessities for tea is somewhat different: this one focuses on transporting tea and lets you choose the steeping and sipping vessels and other accoutrements. Four tins are included in this travel kit — fill ’em with teas, or put tea in three tins and your powder/granulated sweetener in the fourth. Elastic straps of varying size hold a travel steeping/drinking cup and other accoutrements that you supply yourself according to your preferences. There are also pockets under the tea tins that let you tuck in paper filters, packets of sweetener, or even teabags. 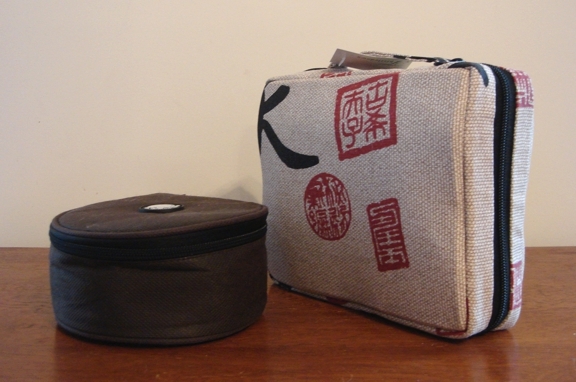 Two different concepts of a tea travel kit. Choose the one that’s right for your needs. I like the size of the Taiwan kit and that it contains both steeping and drinking vessels. I like the versatility of the Thistledown kit; I was thinking that I could fill the cup with water and cold-infuse my tea. (I never steep tea with hot water in any kind of plastic vessel.) 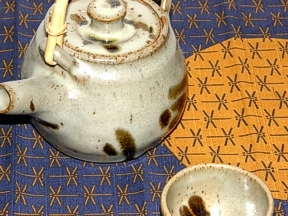 The cold-infusion method works best with white and oolong teas, which are less prone to becoming bitter from lengthy steeps. Although my Taiwan-made kit is no longer available from the retailer where I bought it, you can find similar kits at many other retailers, both online and walk-in shops. Perhaps your favourite tea vendor sells them. Thistledown distributes via wholesale only; visit their website to locate a retailer who carries them. Now if only someone could figure out how to include a hot-water kettle!! Relative size of the two tea travel kits.